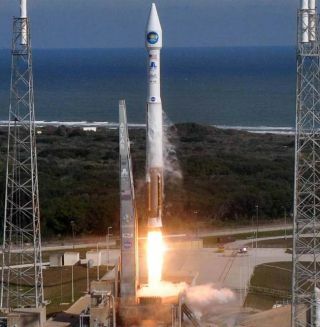 NASA has selected an Atlas 5 rocketto launch an orbiter inNovember 2013 to study the ancient climate record of Mars, the agencyannouncedThursday. The Mars Atmosphere and VolatileEvolution, or MAVEN,spacecraft will collect the most detailed data ever obtained on the RedPlanet's atmosphere. Scientists expect MAVEN will help unravelthe mystery of how Mars transitioned from a wetter, warmerplanet to thebarren landscape of today. The MAVEN spacecraftwill blast offin November 2013 on a United Launch Alliance Atlas 5 rocket from CapeCanaveral, Fla. The mission will use the Atlas 5's basic configurationwith nosolid rocket boosters, a single-engine Centaur upper stage and a4-meterpayload shroud. The preliminary launch period, whenthe orbits of Earth andMars are properly aligned for an interplanetary journey, opens Nov. 18andcloses Dec. 7 in 2013. MAVEN will arrive at Mars in September 2014. The total value of the launch serviceis $187 million. Thatcost includes the Atlas5rocket and additional contracts for payload processing,launch vehicleintegration, mission-unique ground support, and tracking and telemetryservices, according to a NASA press release. The MAVEN agreement is the agency'sfirst launch deal underthe second NASA Launch Services contract announced in September. Thenew NLScontract covers launches of robotic NASA spacecraft for the next decade. MAVEN's launch contract was held upafter the last NLS dealexpired June 30, according to a senior NASA official. NLS contracts are multiple awardindefinite delivery,indefinite quantity pacts with launch companies covering potentialflightopportunities. NASA can order up to 70 missions in the new NLS contractfor amaximum value of $15 billion. Managed by NASA's Goddard SpaceFlight Center, MAVENreceived management approval to proceed into full development during anOct. 4confirmation review. That decision point followed a successfulpreliminarydesign review this summer. The MAVENspacecraft is a downsized version of the Mars ReconnaissanceOrbiter busbuilt by Lockheed Martin Corp. The mission's cost is $438 million, notcountingthe launch services contract unveiled Thursday.